Socks, electrically heated, type D. Stores reference 22c/721 & 4. Size medium. Green gaberdine outer to which is sewn a heating element and stockinette fleece lining. 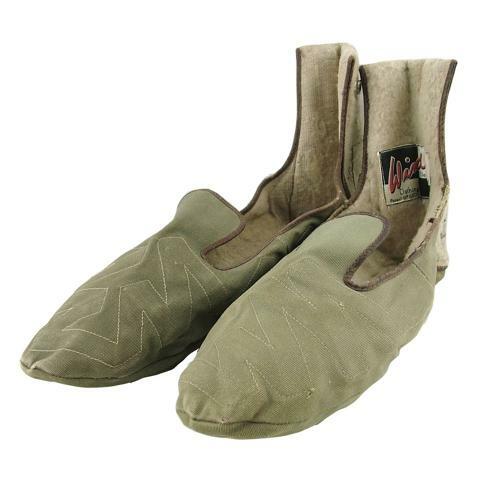 The ends of the element terminates above the heel and are riveted to press studs that can be connected to a wired Sidcot flying suit or other wired garments. A matched pair with only minor colour differences. Both are in good condition externally but the linings have some moth damage, small holes and fleece loss. With King's crown markings and Windak label. Stock code B22310.